Is PayPal Extras MasterCard Good or Bad? If you ever read reviews of PayPal Extras MasterCard, you will see many negative ones. Most of them complain about its reward program. They are telling the truth. It has low value of reward point. But if you use it correctly, PayPal Extras MasterCard is not bad at all, or rather one of credit cards you must have. You earn 3 points per dollar on restaurant and gas, 2 points per dollar on eBay and PayPal, 1 point on everything else. When you redeem points for $50 cash back, you will need 6000 points. This means 1 points = $0.0083 (0.83% cash back). This is cheap. However, PayPal Extras MasterCard is the only credit card you can earn extra bonus on eBay purchase. Today, you can’t find eBay gift cards in any department stores or supermarkets, so buying gift cards with a credit card offering bonus reward is no longer available. And, not only eBay, but also many merchants accept PayPal. Use this card on eBay and PayPal only, nowhere else and the cash back will be 1.66%. This beats 1.5% cash back of Quicksilver Cash Reward. You can also redeem points for gift cards. 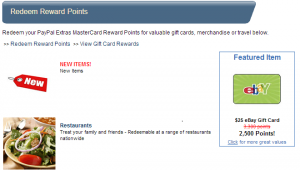 The higher denomination of gift cards you choose, the higher the value of points will be. For example, $25 Sears gift card needs 3300 points (1pt=$0.00757), $200 needs 22500 (1pt=$0.00888). And there is always one featured $25 gift card that need only 2500 points to redeem (1pt=$0.01). So, using the card only for eBay and PayPal gives 1.66% to 2% back to you. Please note that maximum points you can earn in a card year is 50,000. If you use the card for only Paypal purchases, $25,000 is eligible for the reward points each year. In a nutshell, PayPal Extras MasterCard is the best credit card for those who use eBay and PayPal a lot. Use the card for all merchants who accept PayPal, NOWHERE ELSE. No gas, no restaurant, either because there is a limit on point you can earn in an year, and there are other credit cards offering equal or better reward program for them. You don’t buy stuffs on eBay? After you read some posts about gift cards, you will. Gift cards are essential items for money saving, and eBay is one of the biggest markets of discounted gift cards!